With Tiger Stadium long gone, the Detroit Zoo is officially the oldest site where Detroiters can catch a glimpse of tigers. Gerry VanAcker, the Zoological Park’s new chief operating officer, understands that history as well as anyone. A Lansing native, VanAcker graduated from Michigan State University and has spent 27 years in the hospitality industry. Aside from acting as general manager for Detroit’s Marriott Hotels (VanAcker’s employer for 23 years), he also owned and operated several Au Bon Pain bakeries, which he introduced to this area. Just five years ago, Detroit City Council unsuccessfully attempted to shut down the Detroit Zoo. VanAcker recently talked about changes occurring at the park, and how he plans to keep it off the endangered list. 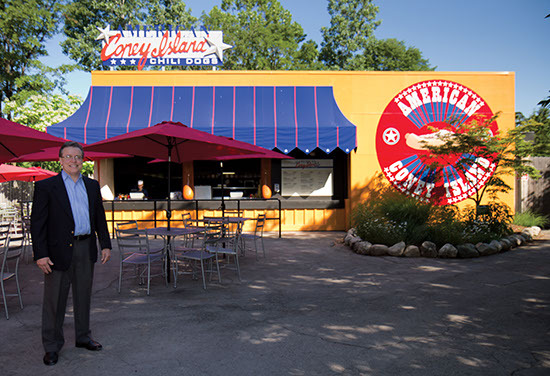 You’re a former restaurant owner, so I have to ask: How’s the Detroit Zoo’s new American Coney Island? It’s fantastic! It’s the exact same concept as the one downtown. The owner, Grace Keros (the third-generation owner of the American) is in here two or three times a week. It was really fitting that two longstanding Detroit institutions came together. 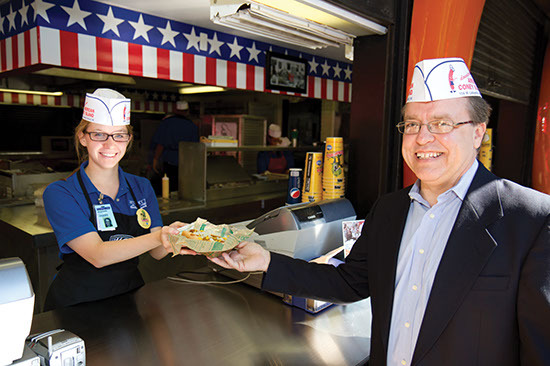 Detroit Zoo COO Gerry VanAcker takes a coney from an employee at American Coney Island. That’s great you work with local restaurants. Yeah, we’ve also got a new relationship with Buddy’s [Pizza]. They’re coming out with a zoo pizza. It’s vegetarian, of course. You wouldn’t want any meat on a zoo pizza, would you? You’ve spent a lot of time in the hospitality industry working with people. Does anything change when you add animals to the mix? It’s still all about people taking care of people. The animal focus is important, but as far as my job goes, it’s really human resources, guest relations, and park operations. It’s like in a hotel; you have a facility that needs to be kept up and appealing. Do you have any specific projects for increasing revenue? We’re re-doing the lion habitat right now. It was originally opened in 1928, but when it’s finished, it’ll be twice its former size. And the moat [which once kept patrons at a distance] has been filled. We’re putting in 16-foot glass viewing panels to bring visitors nose to nose with the lions. You feel like you’re almost part of it. 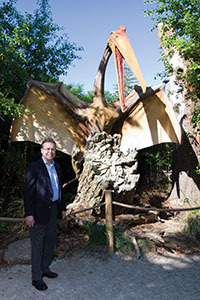 And then, we’ve got the Dinosauria exhibit this summer. 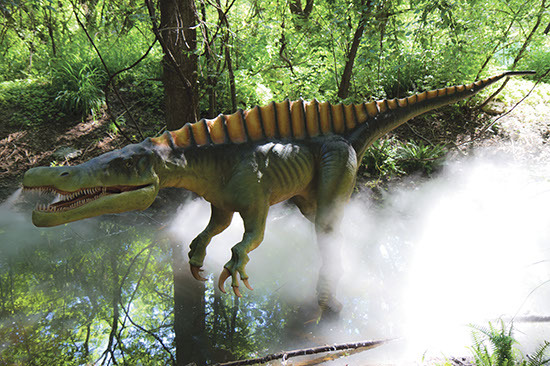 There are over 30 lifelike, animatronic dinosaurs that roar, snarl, and move around — “Zoorassic Park,” we call it. It’s on three acres and goes through a dino-trail where we’ve even got dinosaurs that spit water at you. Did you look at other zoos for elements you might incorporate here? Absolutely. And what we’re doing a lot more of is going to the animal’s actual habitat. Going to where the animals live and exist, and trying to replicate that natural surrounding, is best for the animals. And it really makes an authentic experience for guests. Do you have a favorite animal at the zoo? The black bear. I’ve been in Michigan all my life, so I like our wildlife the best. You’ve got a lot of experience in hospitality. Is that what the zoo needs right now? I think so. My goal is to do a lot of training on customer service. As I worked at Marriott, the hotels I ran were always in the top 5 percent on customer service. That’s the kind of delivery I want to produce here. I’ve got a lot of experience in construction as well, and there’s a lot of that going on. I understand you played a role in bringing lofts to Detroit. When I went downtown, I saw an opportunity to do some development work down there. I was able to join several groups as a silent partner, invest money, and help with the development downtown. The zoo belongs to Detroit, but it lives in the suburbs. What role does that give it? [The zoo] is supported by the suburbs, [but] technically the assets are supported by the city. I think it can be very instrumental in [inviting] collaboration between those two entities. 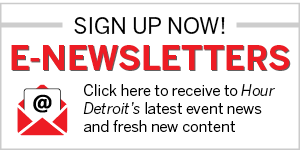 Rumor is, Detroit might end zoo funding entirely. How do you plan around that? We have to do the best with the resources we have, and manage new projects effectively. There’s something about the zoo, though, and I’ve learned this as I’ve gotten into the position: People really take the zoo on as their own. There’s a lot of public interest and pride. I feel lucky to be able to be here, try to help out, and take it to a new level.